For centuries, scientists disseminated their research in journals that large publishers printed and distributed. At the time, that made sense. But in the Internet age, many scientists are questioning this process. Why shouldn't they just post articles online, free for everyone to read? It's not just scientific publishing that faces change, of course. Digital technology, from e-books to blogs to Twitter, has thrown the whole publishing world into confusion. Pundits pontificate on the future of the press, and bibliophiles blubber over the future of books. Nothing like this has ever happened before—or has it? Actually, 500 years ago in Europe, a newfangled thing called “printing” set the stage for major social and scientific upheaval. 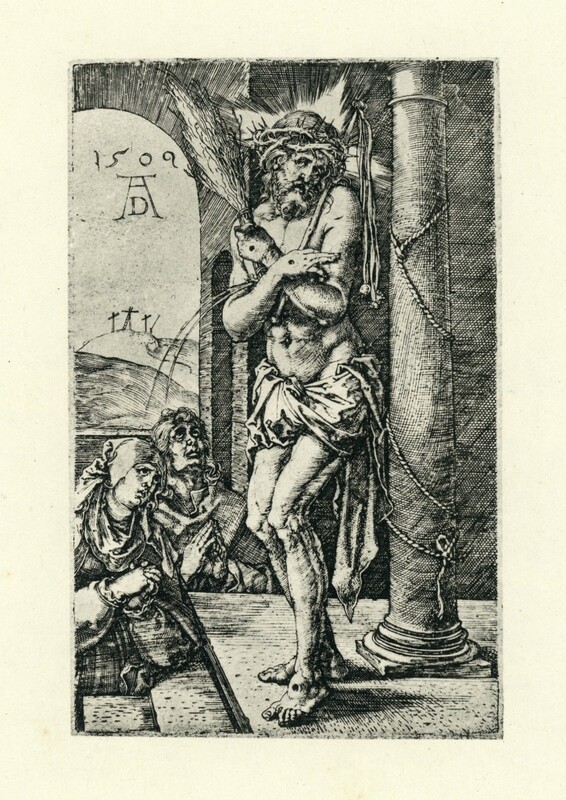 Man of Sorrows, from The Passion of Jesus Christ series of engravings by Albrecht Dürer, 1509. On display at the USF Reformations exhibition. Johannes Gutenberg and his printing press are well-known to most Western schoolchildren. Less familiar is Albrecht Dürer, an artist, engraver and geometrician whose work influenced much of Europe’s early print culture. Both men loom large in a new exhibition at the University of San Francisco called 'Reformations: Dürer & the New Age of Print,' which will run through February 22 at USF's Thacher Gallery and Donohue Rare Book Room. Fourteen students from USF's new Museum Studies graduate program curated the exhibit, led by professor Kate Lusheck and aided by Glori Simmons, gallery director, and John Hawk, head librarian of Special Collections and University Archives. Would that make the great print center of Nuremberg, Germany “the Silicon Valley of its day”? It was well poised to become so. Printing presses use metal movable type and were often illustrated with metal engravings, and Nuremberg was rich in metals and those who knew how to work them. Gutenberg himself began his career as a goldsmith; Dürer learned the art of engraving from his goldsmith father. 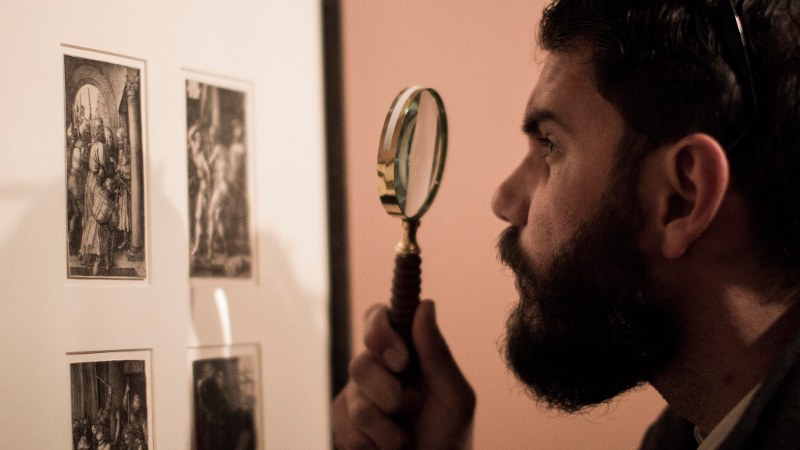 The central display of the 'Reformations' exhibition is an original Nuremberg Chronicle. The book mixed text and images to present the Biblical history of the world, from the days of Eden right up to the year 1493, the year it was published. Printed by Dürer’s godfather, Anton Koberger, it was so popular that it spawned early “pirated” copies by other printers. While many of the first printed books were religious texts, such as Gutenberg’s Bible and Dürer’s Life of the Virgin, early Humanists also used the new presses to produce textbooks on botany, medicine and math. Dürer himself, a true Renaissance man, wrote and published several geometry treatises in German—making them more accessible than the Latin that was commonly used for "serious" works. 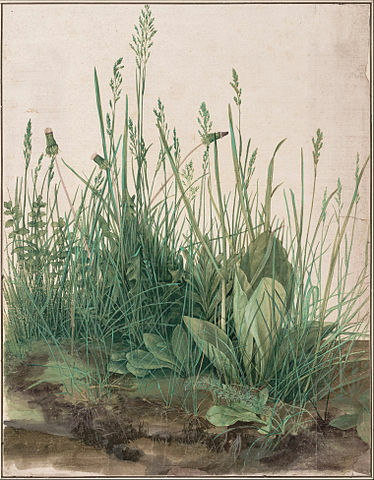 The Large Piece of Turf, a watercolor by Albrecht Dürer in 1503. Not currently on display, though there are great plants in many of the Dürer prints in the exhibit. Dürer’s interest in the natural world often shows in his art: he is famous for squeezing landscapes into indoor scenes and drawing specific, rather than generic, plants. He was hardly the only empiricist of his time. The 'Reformations' exhibition includes a “pocket herbal” with woodcut and hand-colored illustrations, a medical text showing an early operating theater and an accounting book that demonstrates how to count into the thousands with your fingers. However, the real passion of the Humanists lay in reviving Plato, Virgil and other ancient writers. The new print technology made it far easier to distribute the old manuscripts they discovered, just as modern researchers are now able to scan out-of-print books and distribute them digitally. Thus, the disruptive technology of the 16th century set the stage for rationalism, empiricism, and arguably much of modern science. Now the disruptive technology of the 21st century is facilitating a new open science movement. The printing press is what first made "open science" possible. The new ease of distributing discoveries allowed scientists to collaborate across continents, just by submitting their articles and subscribing to the same journals. However, what was once a revolutionary system has faced increasing criticism in recent years, as illustrated by a boycott of Elsevier, one of the largest scientific publishers, that began in 2012 and has garnered almost 15,000 researcher signatures. Many scientists object to the prevalence of journals with subscription fees beyond the budget of the average citizen; the cost of even a single article can be $20 or more. They argue that publicly funded research should be publicly available. In fact, the National Institutes of Health mandates that any research it funds must be open access, meaning free to read. Mathematicians have taken to self-publishing their work in a free online repository called the arXiv. Meanwhile, websites such as the San Francisco-based Academia.edu and Berlin-based ResearchGate are trying out new models of scientific sharing—"Facebook for scientists." And yet in the midst all this change, much remains the same. Scientists still think of their research in terms of publishable papers, which they write and format as if for print. It's human to seek familiarity, to create continuity with the past. Early printers tried to make their books look like hand-written manuscripts by drawing in marginalia and illuminated letters—an aesthetic we can still appreciate today. So what will the future of scientific publishing—indeed, of all publishing—look like? It's hard to tell from inside the revolution.